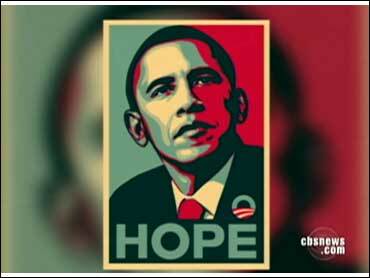 The Associated Press has filed a counter-lawsuit against artist Shepard Fairey over his use of an AP image as the basis for his famous "HOPE" poster of President Obama. Last month, Fairey sued AP, claiming that his use of the image constitutes "fair use." According to Paid Content, Mannie Garcia, a freelance photographer working for AP, took the picture of Obama's face in April 2006. Fairey later took Garcia's photograph and created the stylized red white and blue poster that became an icon of President Obama's campaign. "Fairey transformed the literal depiction contained in the Garcia Photograph into a stunning, abstracted and idealized visual image that creates powerful new meaning and conveys a radically different message that has no analogue in the original photograph." AP does not agree. In the countersuit, the company said that "Fairey has done nothing that would excuse his blatant copying of, and creation of derivative works based on, the [AP photo]," Reuters reported. AP said that the image has been copied in its entirety and that Fairey has illegally profited off the hundreds of thousands of stickers, t-shirts and other merchandise bearing the image. "This lawsuit is about protecting the content that The Associated Press and its journalists produce every day, with creativity, at great cost, and often at great risk," said Tom Curley, president and CEO of AP. In order to win the suit, Fairey needs to prove to the court that his poster was "transformative" of the original photograph instead of mainly "derivative." There is no universal standard for transformation so the decision will depend on the conclusion of the judges. Fairey may also need to deal with the effect his poster may have had on the original value of the photo. Besides the HOPE poster, Fairey is known for his viral street art, including the widespread "Obey Giant" sticker and graffiti campaign. As a graphic designer, he also produced artwork for music groups and companies such as Pepsi and Netscape. "I would like to thank you for using your talent in support of my campaign. The political messages involved in your work have encouraged Americans to believe they can change the status-quo. Your images have a profound effect on people, whether seen in a gallery or on a stop sign. I am privileged to be a part of your artwork and proud to have your support." Interestingly, in their lawsuit, AP points out that copying other artists' work "is part and parcel of [Fairey`s] willful practice of ignoring the property rights of others for his own commercial advancement." Two Boston globe editorials talk about Fairey's alleged use of other people's art as well as his "cease and desist" notices to artist Baxter Orr, who has made art based on Fairey's Obey Giant. As for Garcia, the New York Times quoted him as saying "If you put all the legal stuff away, I'm so proud of the photograph and that Fairey did what he did artistically with it, and the effect it's had."